Give your farm or product outstanding exposure! The current 2018 issue of Purely Suri Magazine is now under production. The deadline for advertising reservations and final ad art work is October 1, 2018. Shop now for the ad you want! Yes, we will still have the printed issue. But, now the entire magazine is viewable on the internet including your AD! Further, if your ad has a website in it, any visitor can click on it and go straight to your website. PurelySuri will be available for the entire world! Act now and reserve your space and expand your marketing through our new online promotion. The Suri Network reserves the right to review and decline any advertising that is contrary to the purpose of promoting the Suri alpaca. While we are sensitive to breeders who raise and sell both breeds, the Suri Network’s sole purpose is the promotion and support of the Suri breed. Mention of Huacaya or other animals raised may be made; however, pictures may not. For instance, you will not find pictures of Herefords in a publication issued by the Black Angus Association. Files created in Quark Xpress, Photoshop, InDesign or Illustrator. Can also accept any high resolution (300 dpi) jpg, tiff, pdf or eps. Advertiser will be notified if the resolution of their file does not meet requirements. Files can be sent on disk or emailed in high resolution format to Steph Pride at email shown below. 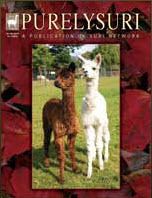 Starting with the 2005 PurelySuri™ Herdsire edition, any farm/ranch who acquired a Premium Ad Space will not be eligible for the same space for the next two PurelySuri™ publications; and no two-page spreads are allowed in Premium Ad Spaces. Steph Pride, Able Printing Co.